Such an easy style to take on — you know that’s what I look for when it comes to jewelry. I am a huge fan of arm candy, but always have trouble finding rings that work together. My solution? Buy pre-made combos. Great news! 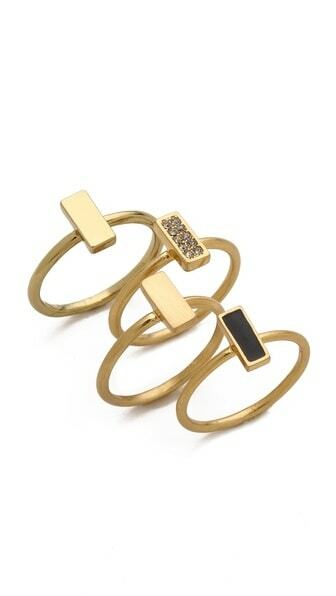 This set of Madewell Bar Stacking Rings will run you under $30. I love the simplicity of the design. You can wear these rings every single day of your life and I think I will since I just bought them. HA! Bill if you are reading this… it was for BLOG RESEARCH! Don’t judge. Since they are separate pieces, you don’t technically have to wear all four at once, but I think that’s part of the fun. Really on trend this season. Do you wear stacked rings?